RCMP salaries lag behind most of their provincial and municipal counterparts – and the national police force is also slipping when benefits and pension are weighed in. 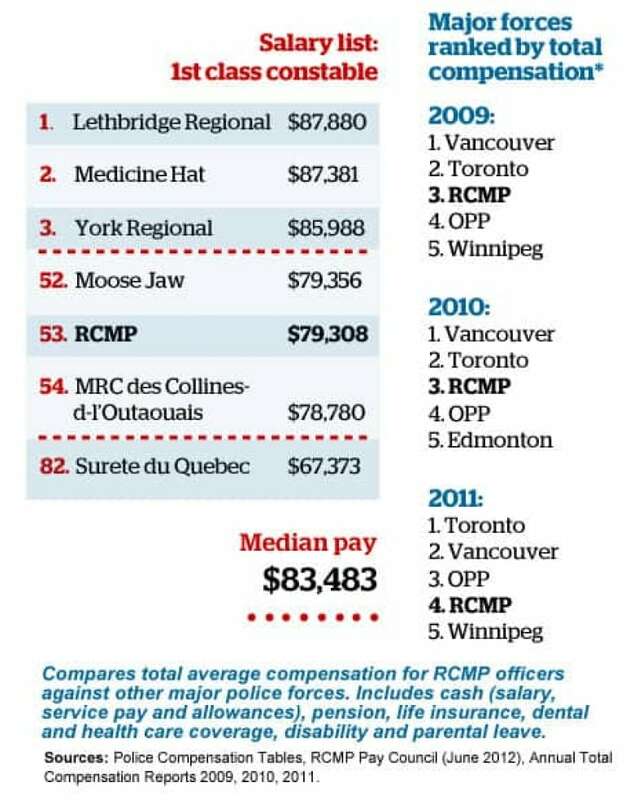 An internal report from the RCMP Pay Council dated June 2012 that compares salaries for first class constables across the country found the RCMP ranks 53rd out of 82 Canadian police forces surveyed. An RCMP constable’s salary is $79,308 – behind the national median of $83,483 and trailing the top Canadian constable's salary of $87,880. The report also shows the RCMP has dropped to fourth spot, behind the Ontario Provincial Police, among Canada's nine biggest police forces when it comes to total compensation that includes pension, allowances and benefits. 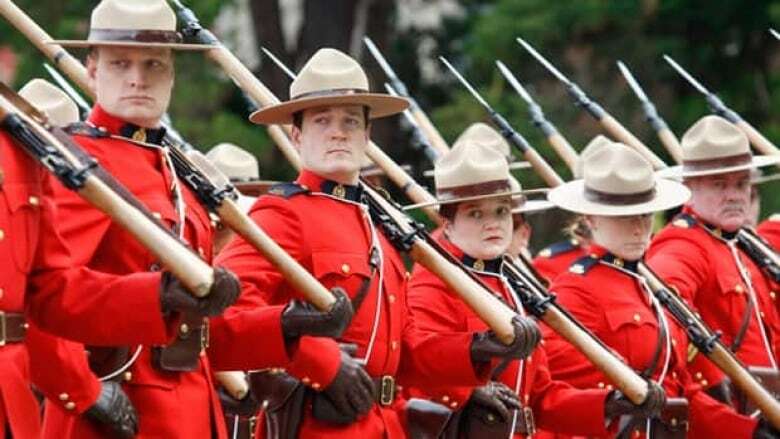 Mounties are paid less than their counterparts in Moose Jaw, Sask., the Ontario cities of Guelph and Belleville, and most of Canada's big cities. Because the RCMP is not unionized, the pay council recommends compensation based on the average of the top three police departments, and is ultimately established by the RCMP's employer, the Treasury Board of Canada. RCMP spokesman Greg Cox said there are no signs the slipping compensation is having an impact on replenishing the ranks. "Recruiting does not have any evidence or analysis to indicate that pay has had a negative impact on recruiting efforts," he said. Sean Osmar, press secretary for Treasury Board president Tony Clement, said the total compensation analysis comparison shows the RCMP compensation is "competitive." But Rob Creasser, a retired constable who's been fighting to unionize RCMP officers and a spokesman for the Mounted Police Professional Association of Canada, said there is no collective bargaining, only "collective begging." And that has led to an erosion of benefits that could have a long-term impact on morale and quality of the force, he said. "You're never going to attract the best and the brightest given where we sit," he said. "I think people who are looking at policing are certainly looking at wages and benefits as, if not the primary, certainly a major component of the decision-making process." Case and workloads are often much heavier for RCMP officers than for provincial, regional or municipal officers, Creasser said. Speaking on CBC News Network's Power & Politics, NDP strategist Brad Lavigne said the federal law that bars an RCMP union puts members at a disadvantage. "The best way to sort this out is to allow them to bargain freely like other police forces do … Let them unionize and work with their employer to hammer out what precisely the pay should be," he said. Conservative strategist Geoff Norquay said the federal government has not been "insensitive" to wage-disparity issues in past. "It’s a competitive situation, and I think that the employer will recognize at a certain point, if the RCMP is at a disadvantage, and they’ll fix it," he said. This story has been edited from an earlier version that originally missidentified Treasury Board President Tony Clement's press secretary, Sean Osmar.